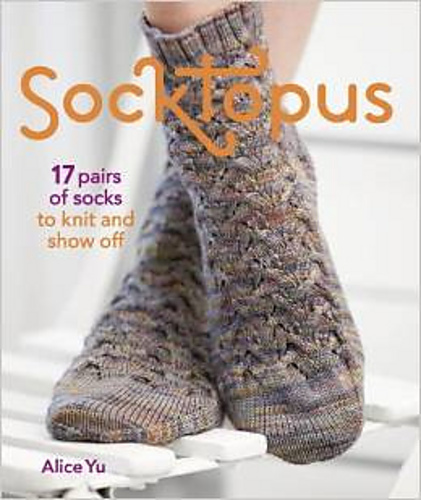 Hubby is great inspiration for socks - these ones I designed with him in mind. 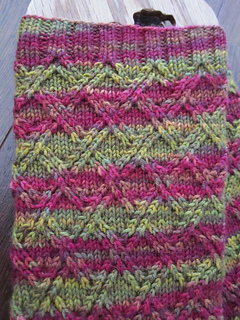 I love my variegated yarns but so often stitch patterns just get lost in all the colour. The double lattice is perfect for these types of yarns - distinctive enough to hold its own, with the added pizazz of lots of splashes of colour. Under Leg Notes, the start of round changes on rounds 5 and 9, not 19. The pattern says to repeat rounds 1-16 four more times in the Leg section. Wollmeise sock was knit with four repeats in total of 1-16, and the STR sock was knit with three repeats in total of 1-16. 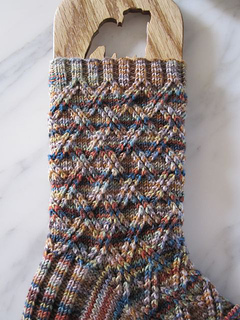 For a longer sock you can do an extra repeat of rounds 1-16, just be sure you have enough yardage for it.